Many homeowners rely solely on air conditioning to keep their homes comfortable during the hot months of the year. This causes the AC unit to overcool the home, making the living environment uncomfortable. It also places a big burden on the air conditioner and electric bill. One of the best things you can do for your air conditioner is give it a high-powered sidekick that can lighten its load—a trusty dehumidifier. These systems lower the amount of moisture in the air so that the air conditioner doesn’t have to work overtime to achieve a comfortable relative humidity in the home. It’s important to find the right size and model of dehumidifier for your home. The decision largely comes down to the size of your home and the climate of its location. The right dehumidifier exists for every home in every location. Here’s a quick chart to show the amount of water each Aprilaire model can remove from the air. Then a rundown of different locations and what they require for dehumidification. Of course, it’s always a good idea to consult your local Aprilaire dealer to make sure you find the ideal solution. A finished basement is a point of pride in the Midwest, so it’s only right to protect it and make sure it’s better than your neighbor’s. Excess moisture seeps in from the surrounding earth and can make basements damp and musty, and even encourage mold growth. A dehumidifier works to control moisture levels and keep your prized basement a healthy and comfortable environment. In an average Midwest climate, the Model 1850 is likely your best bet. The southern United States is home to high humidity and snowbirds—the smart ones among us who move from the north to warmer climates during the winter months. 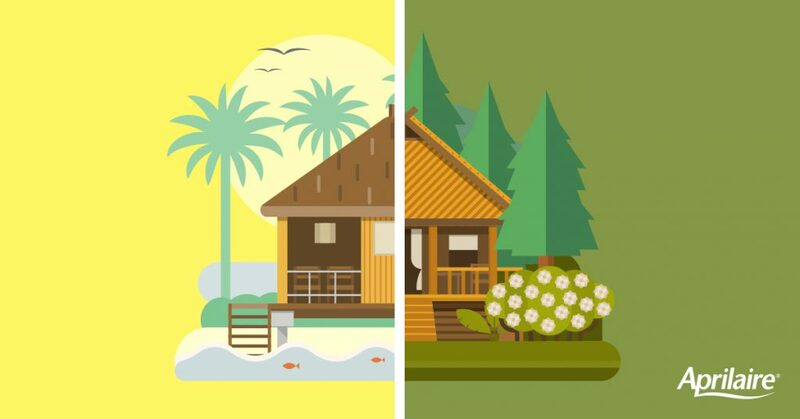 Both of these factors can negatively impact the longevity and health of homes in this area. Humidity can build up while residents are away during the hottest summer months, potentially leading to structural damage and mold growth. When the homes are occupied, the air conditioner is usually running nonstop and that can lead to overcooling. A whole-home dehumidifier is perfect for climates with constant high humidity because it helps make the air conditioner more efficient. It also keeps the entire home comfortable and free of wood rot and other moisture damage so you can focus on enjoying your winter getaway. Homes in this part of the country are often built with crawl spaces. When water gets into these areas, it can mean structural damage to the home and a shrinking condition for your wallet. What’s more is that excess moisture and temperature changes in the crawl space can travel up into the rest of the home, creating potential issues with mold, mildew, and insect infestations. The best way to solve this problem is to seal up the crawl space and manage the dew point, which can be done using a freestanding dehumidifier like the Aprilaire 1850F. The fabled “dry heat” of the southwest United States can present a different set of problems for home comfort. If you’re running an air conditioner to stay cool, it can zap the already low amounts of moisture from the air. Dry air leads to dry skin, a scratchy throat, and annoying electric shocks. That’s when a humidifier can come in handy. It adds the perfect amount of moisture back into the air so your entire home can stay comfortable during the hottest, most arid times of the year. There are many options for humidification, so find what’s right for your home. Worried about monitoring humidity levels? The Aprilaire thermostat and control lineup gives you intuitive command of the relative humidity in your home. It also includes smart settings that control humidity levels automatically. They make it easy to enjoy a comfortable living space without needing to sweat the details! Before deciding on a humidity control system for your home, consult a certified Aprilaire installer. Our locator tool makes it easy to find a pro in your area.